Child’s Christmas Hankie – Goldmine or Giggles? Home » All Blog Posts » Child’s Christmas Hankie – Goldmine or Giggles? There are literally thousands of Christmas handkerchiefs still in existence. Even when people defected to Kleenex, ladies often carried a lovely Christmas hankie in their purse. In addition, holiday hankies made the perfect gift for a teacher, aunt, neighbor, pastor’s wife, and all those to whom you wanted to say “Thank You” or “You’re Special.” Thus, most women often had a Christmas handkerchief or two, and since they were used only one or two weeks a year, they’ve lasted through the decades in great shape, including Christmas handkerchiefs for children. Today I chose to focus on an interesting little number I felt deserved a spotlight of its own. It features Santa and his reindeer. Before we continue, can you name Santa’s reindeer? Give it a try. (no fair googling…) We’ll check and see how you did in a moment, but first…..why did I find this hankie so special? In order to answer that question, we’ll need to digress for a short history lesson. First issued in 1918, it depicts the image a Curtiss JN-4. First used in WW I, the planes were later employed to transport mail. If you think it looks a little odd, you’re right. The plane is upside down, which makes it very rare. For you trivia buffs – the center was printed first, so it’s the border that was actually printed upside down. The mistake was caught almost immediately. Only one page of 100 inverted stamps was ever found. 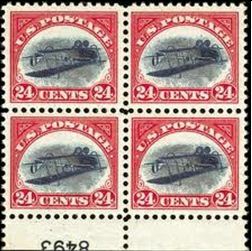 A single inverted Jenny sold in November 2007 for US $977,500. In October 2005 a block of four inverted Jennys sold for US $2.7 million. What on earth do flawed postage stamps have to do with a child’s Christmas handkerchief? Stay with me, we’re almost there. 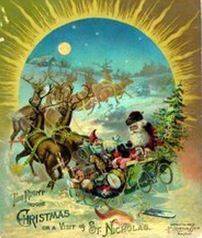 hankie has Santa gaily giving loose reign to his team of flying helpers. Now back to the reindeer. Could you name them? 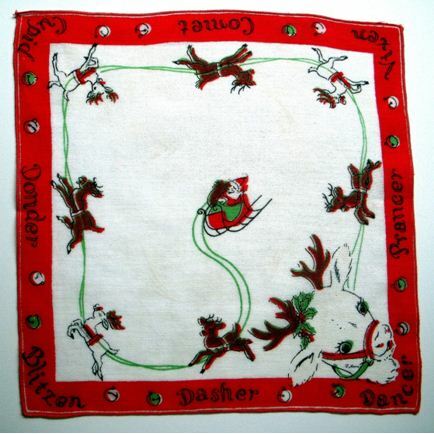 I found this charming hankie to be especially fun because included in the border is a roll call of the reindeer, helping a child to learn all their names. Well, sort of….. Ever heard of Donder? I guess he subs when Donner gets a cold…. 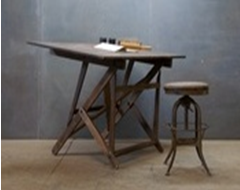 I can envision some poor artist slaving over his drafting table, attempting to finish one more image before he could pack up and head home for the night. What were those reindeer names again? There was no google. Santa’s reindeer weren’t listed in the dictionary. The artist had to trek to a bookstore or library to find the reindeer names. But what if it was 11:00 o’clock at night? Well, you rely on your memory from childhood. 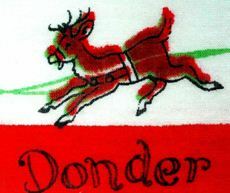 On Dancer on Prancer, on… Donder sounds about right. Yeah, Donder, let’s go with it. So, there you have it – this child’s Christmas hankie is my own personal “Inverted Jenny.” Let’s recap. 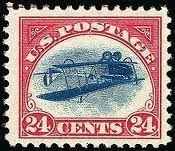 The most recent Inverted Jenny sold for $977,500. By my calculations… and the rarity of finding this hankie ever again in the history of handkerchiefs, I’d say my Donder “find” is worth….. the price of a good laugh. Speaking of colds and shiny red noses, where is our fearless leader Rudolph? He seems to be missing from the scene. Let’s swing back and count the reindeer one more time. Yep. Only eight. Where IS Rudolph? “Oh come on”, you may chide,” this is a fun little hankie, subject to artistic license. You don’t need to show every single reindeer.” Oh really? Ask any parent who has ever tried to skip ahead a few pages in a bedtime story their child knows by heart, and you’ll hear differently. Children are literal. You name the reindeer, you’d better show the reindeer. Kids want to count them, name them, and point to each one. But alas, no Rudolph? Give a child this hankie and brace yourself for 20 questions. At first I thought, I’ve seen many hankies which feature Rudolph, but this is the first hankie I’ve found devoted entirely to the back-up boys. This hankie honors the worker bees, not the queen, the soldiers, not the general. These reindeer are the domestiques of the Tour de France, the defensive linemen for the quarterback. Clement Clarke Moore wrote The Night Before Christmas in 1822. It was first published in December 1823. 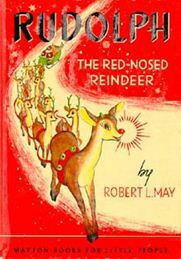 Rudolph the Red Nosed Reindeer, written by Robert May, was first published in 1939. 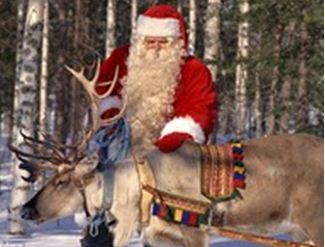 Santa’s eight reindeer had been flying for 116 years before Rudolph made his first appearance. He was just a pup, a young interloper who joined the team and become an overnight sensation. 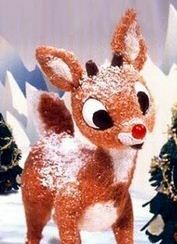 The author’s brother-in-law, Johnny Marks, adapted May’s story of Rudolph into a song, which hit #1 on the U.S. charts in Christmas of 1949. It sold 2.5 million copies the first year, eventually selling 25 million copies, and it remained the second best-selling record of all time until the 1980s. Take that, Mick Jagger. Santa’s devoted team probably encountered the same shock. Instead of a red convertible, the new guy had a nose that glowed in the dark. Top that! The interloper is suddenly Mr. Popularity, with his own best-selling theme song to boot. Yet Rudolph is so friendly and adorable, and so essential to Santa’s mission, we can’t help but love him. Knowing the reindeer history and publication dates affirms this hankie is pre-1949, and quite possibly pre-1939 when May’s story was first published. Because Rudolph became a super star the moment his record was released, and remained so, I doubt you’ll find an image of Santa’s reindeer without him after that time. P.S. Come to think of it, I may have called that reindeer Donder myself when I was a wee tot. It seems easier to say than Donner, particularly if you’re only three years old. I enjoyed reading your story. I have 1 of these lovely kerchiefs however the handkerchief hero’s mentions 6 none of those match mine. I have the whole Rudolph Story (pictured) with all nine Reindeer and they are all named it’s very large 2 ft x 2 ft never used & has the copyright tag sewn to it dated MCMXXXlX Robert L May Rudolph The Red-Nosed Reindeer. You have a Rudolph scarf. It sounds fabulous. Love to see a photo. The handkerchiefs I have are much smaller and are for decorative use to peep from a pocket.